Holly Mauser, DMD, recently joined Victor Brown, DMD, PC, and Tod Twichell, DDS, and the Cole Memorial Dentistry team. Dr. Mauser received a Bachelor’s degree in Biology from Susquehanna University in Selinsgrove, Pennsylvania prior to completing her Doctorate in Dental Services at the Temple University Maurice H. Kornberg School of Dentistry. She performed volunteer service for community outreach and dental programs in Allenton, Bethlehem and Philadelphia, Pennsylvania. 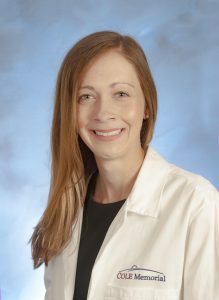 Prior to joining Cole Memorial, Dr. Mauser did her residency at the Jamaica Hospital Medical Center Dental Program in Queens, New York and worked for First State Oral and Maxillofacial Surgery in Dover, Delaware. She was also a research scholar for the Lehigh Valley Health Network (LVHN) in Muhlenberg, Pennsylvania. Dr. Mauser participated in the LVHN research scholar poster presentations and co-authored a publication at Kornberg School of Dentistry that focused on “Dentistry and the Environment.” She is a member of the American Dental Association and American Dental Education Association. Cole Memorial Dentistry provides general dentistry for patients of all ages at two locations in Coudersport plus, children’s oral hygiene in the Coudersport Pediatrics Department. Their experienced dental experts use advanced technology and digital x-ray equipment to perform dental services. Cole Memorial Dentistry accepts most major insurance plans. Major credit cards are also accepted.